It used to be that ‘technology’—especially involving audio, video, and lighting—was somewhat of a dirty word in houses of worship. As a vehicle through which to communicate spiritual messages, it just didn’t seem right; it was too performance-based, too much like show biz. 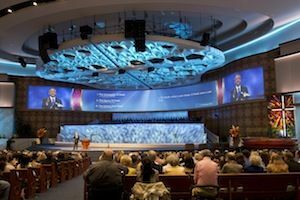 At First Baptist Church of Dallas in Dallas, TX, the biggest technology element installed by Acoustic Dimensions is the screen that sweeps across the front of the room. The main visual image in the space is a 130-foot by 12.5-foot screen with seven HD projectors edge blended to create the continuous image. To address this, Janssen went so far as to hold training sessions for his staff based on the negotiation principles developed by Harvard, which focus on interest-based discussions. In other words: How do companies process what their clients’ best interests truly are? “Forget about technology—that’s not what’s important here,” he said. “What’s important is how you get to the root of what’s really important to the client.” This is not to say that the customer is always right, because we know that many times they are not. But in examining their best interests and the true purpose behind why they have sought your counsel, you’re better positioned to offer them real value. Clair Bros Audio installed a new audio system in Prestonwood Baptist Church in Plano, TX . The system was updated with two Studer Vista M2 desks for monitors and FOH and a Vista 9 to handle broadcast production for special events and services, Clair i218 line arrays, flown Clair cardioid sub low arrays, Clair 15CX high-Q fills, Lab.gruppen PLM-series amps, Studer digital consoles, Roland M-48 personal monitor systems, flown choir monitors (three Clair 15CX’s and two R2T’s), 18 Clair 12AM wedges and new floor subs and front fills. As HOW clients grow more tech-savvy and require less design and integration assistance because they are taking on some of those tasks themselves, the coordination and management of projects is one area where Michael Garrison Associates is finding new revenue.